When I was thirteen years old, I witnessed a car crash in front of my parents' house. It was a bright red convertible, going far too fast -- and the driver was not quite able to negotiate the curve that the road made right by our driveway. The car hit a road sign, went airborne, flipped in midair, and skidded down the hill in the neighbor's yard on its top. My dad and I ran toward it, knowing that the likelihood was that there was a severely mashed human underneath. But amazingly, this was the one-in-a-million situation where not wearing a seatbelt had saved the driver's life. He'd been thrown clear, and came away with no more than cuts and bruises (and a totaled car). But what I remember about this incident most of all is the feeling of complete helplessness -- watching the car careening down the road, seeing it launch itself into the air, being certain at the time (although I was happily proven wrong in the end) that that driver was seconds from his death. To this day, I still have this feeling when I see something rushing toward an outcome that I am powerless to prevent. It's an intensely uncomfortable sensation. I experienced this feeling just yesterday, albeit in a less life-threatening situation, when I ran into a seemingly innocuous story over at the BBC News Online entitled, "Mineral Hints at Bright Blue Rocks Deep in the Earth." 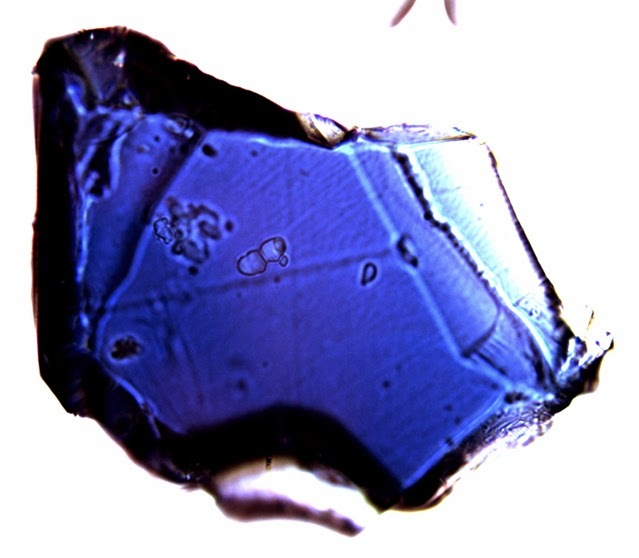 In it, we hear about the discovery of inclusions of a mineral called ringwoodite in diamonds that had formed deep in the Earth (an estimated 600 kilometers underneath the Earth's surface). "Diamonds, brought to the Earth's surface in violent eruptions of deep volcanic rocks called kimberlites," the article states, "provide a tantalising window into the deep Earth. A research team led by Prof Graham Pearson of the University of Alberta, Canada, studied a diamond from a 100-million-year-old kimberlite found in Juina, Brazil, as part of a wider project." "While ringwoodite has previously been found in meteorites, this is the first time a terrestrial ringwoodite has been seen. But more extraordinarily, the researchers found that the mineral contains about 1% water. While this sounds like very little, because ringwoodite makes up almost all of this immense portion of the deep Earth, it adds up to a huge amount of deep water... They also provide the first direct evidence that there may be as much water trapped in those rocks as there is in all the oceans." And that's when I saw the impending car crash. "A key question posed by the observation," the article continues, "is to understand the extent to which plate tectonics on Earth leads to oceans of water being recycled deep within our planet, and to predict the likely amounts of water trapped in other rocky planets." "Prof Joseph Smyth of the University of Colorado has spent many years studying ringwoodite and similar minerals synthesised in his laboratory. He said: 'I think it's stunning! It implies that the interior may store several times the amount of water in the oceans. It tells us that hydrogen is an essential ingredient in the Earth and not added late from comets.'" The Christian bible has some things to say about incredibly large amounts of water deep within the earth. KJV Genesis 7:11 Noah, his family and the creatures, enter the ark 11 In the six hundredth year of Noah's life, in the second month, the seventeenth day of the month, the same day were all the fountains of the great deep broken up, and the windows of heaven were opened. KJV Genesis 8:2 The waters subside 2 The fountains also of the deep and the windows of heaven were stopped, and the rain from heaven was restrained; KJV Proverbs 8:27-29 27 When he prepared the heavens, I was there: when he set a compass upon the face of the depth: 28 When he established the clouds above: when he strengthened the fountains of the deep: 29 When he gave to the sea his decree, that the waters should not pass his commandment. This water was mentioned in the bible when it told of God making all the water below the earth rise and flood the world. Read about Noah. Believe what the bible teaches us. Your soul is at stake. "....all the fountains of the great deep burst open, and the floodgates of the sky were opened. And the rain fell upon the earth for forty days and forty nights. " Genesis 7:11 cf John Lennox Mathematician Oxford U. It is certainly scientific to believe in God, and really now, what sort of spirit promotes hatred for people who do? To no avail. Of course. Direct your free water clarifications to the DM which created the headline, "Revealed:The vast reservoir hidden beneath the Earth's crust that holds as much water as ALL of the oceans." You say, "2000 M cubic km of water fell as rain." Where does the bible say that? Read Genesis 7:11 again. It specifically mentions the breaking up of the fountains of the deep along with the windows of heaven being opened up. This implies that all the water did not come from rain. Besides providing the source for your claim, please show your calculations along with your assumptions. You don't know and can't prove that these bible stories are myths anymore than you can definitively show what a photon is or what gravity is. Neither can you prove by testable replication where and how life originated and diversified. You are as powerless to explain these things as you are to definitively reject these verses in the bible. So if the initial publication of the article led me to feel like I was watching the beginning of an intellectual train-wreck, the aftermath left me doing repeated headdesks. And just because I feel obliged to say it: no, the discovery of a great deal of chemically-bound water in the mantle transition zone does not support the biblical flood story. For one thing, the rocks down there are at at temperature of about 1600 C, so if god "broke up the fountains of the deep," what would come out is not pure, clear water, but a huge gusher of extremely hot magma. No, there is nothing even remotely possible about a Great Flood Covering the Earth, not to mention the whole Noah's Ark nonsense. In order to accept any of that as literal fact, you either have to be (1) ignorant, or (2) engage in confirmation bias to an extent that is truly mind-boggling. And to the scientists who published this research; I know you were just trying to do some cool geology. I know you were excited by your find, and what it might tell us about the chemistry of the Earth's mantle. But we skeptics already spend way more of our time than we should arguing against the biblical literalist lunatics, and trying to stop them from spreading their nonsense into public schools -- and now they think they have some scientific support for their Bronze-Age mythology. Yes, I know it doesn't really support their beliefs, but they think it does, and as a result we're going to be hearing about it for the next ten years. And for that, I don't know if I can ever forgive you.